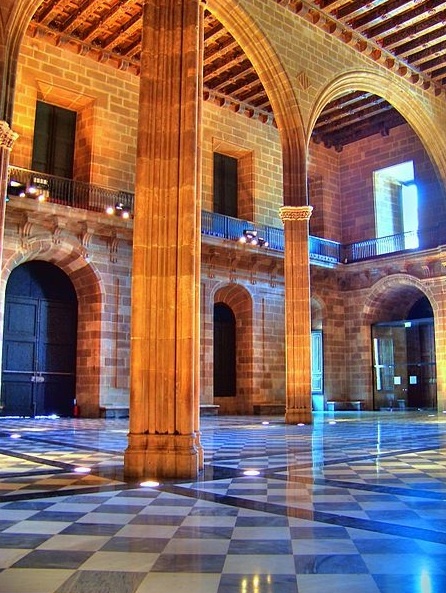 Not far from Santa Maria del Mar, this 'Cathedral of the Sea', the Llotja (stock exchange) was the secular cathedral of Barcelona's merchants, who had to pony up a three percent tax on all imports and exports to pay for it—twice. The navy of Peter the Cruel of Castile damaged an earlier, more modest building. The current one was designed by Pere Arbei for King Pere III the Ceremonious in 1380. Although given a neoclassical facelift, the 19th-century restorers left the Llotja's magnificent Gothic Sala de Contractacions untouched; until Barcelona’s bourse moved to the Passeig de Gràcia in 1996, the wheeler dealers who came here could claim theirs was the oldest continuously operating stock exchange in Europe. It was the largest covered public space in the city for centuries, and saw the city's first opera performances in the 1700s. Part of the building was used as a school of fine arts, where Picasso’s father taught and Picasso attended classes until he quit out of boredom. Today the building is the headquarters of the Chamber of Commerce—if you're in Barcelona in October, ask about visiting the one day of the year when it's open to the public. The other huge pompous building on the Pla de Palau is the Duana Vella, or old customs house, which is even harder to get into, but (at least according to legend) contains a series of murals in the Sala de Actos, portraying the enlightened reign of Charles III (the only useful Bourbon king until the current one), along with life in commercial Barcelona and the sad adventures that befell Don Quixote, in the city where he was unhorsed and forced to give up knight errantry.